Mars rover Opportunity will make a trip of no return into a deep impact crater in an attempt to peer further back than ever before into the geologic history of the Red Planet. The descent into Victoria Crater received the go-ahead because the potential scientific returns are worth the risk that the solar-powered, six-wheel rover might not be able to climb back out and would be forced to end its days there, NASA officials and scientists said Thursday. The rover has been roaming the surface for nearly 3½ Earth years, or some 1,200 Martian days, so scientists and engineers want to send it in while it still appears healthy and before the inevitable breakdown of vital parts that would certainly trap it there. "This crater, Victoria, is a window back into the ancient environment of Mars," said Alan Stern, the NASA associate administrator who authorized the move. "Entering this crater does come with some unknowns," Stern added. "We have analyzed the entry point but we can't be certain about the terrains and the footing down in the crater until we go there. We can't guarantee, although we think we are likely to come back out of the crater." Opportunity and its twin, Spirit, have been exploring opposite sides of Mars since landing on Earth's neighbor in January 2004, discovering geologic evidence of rocks altered by water from a long-ago wetter period of the now-dusty planet. Blasted open by a meteor impact, Victoria Crater is a half-mile across and about 200 to 230 feet (60 to 70 meters) deep - far deeper than anything else the rovers have explored. "Because it's deeper it provides us access to just a much longer span of time," said Steve Squyres, the principal investigator of the Mars Exploration Rover mission from Cornell University in Ithaca, New York. He said it is not known just how much time is represented in the crater's layered walls "but if you have a thicker stack of rocks it's covering more of geologic history, so we're going to see more of the history of Mars here than we've seen anywhere else." Opportunity's first target will be a band of bright material like a bathtub ring about 10 feet (3 meters) below the crater's rim, which will require a drive of more than 60 feet (18 meters) into the crater. "It is somehow different from everything else around it," Squyres said of the ring. "That was the original, pre-impact surface so this bright stuff is the stuff that was in contact with the Martian atmosphere at the time Victoria formed, which may have been billions of years ago," he said. "This is a fairly ancient crater. So this material may preserve in its details information about the interaction of these Martian rocks with the ancient Martian environment." The rover team has named features along the crater's rim as if it was a coastline and have chosen the rover's entry point at a place dubbed Duck Bay, between Cape Verde and Cabo Frio. First, it will have to safely cross a ripple of wind-formed material at the lip of the crater, a kind of feature that has given the rover trouble before. The team plans to initially drive only far enough to have all six wheels on the slope and then back up to the top, to analyze how it performed. "We call that a toe dip," said John Callas, the rover project manager at NASA's Jet Propulsion Laboratory in Pasadena. The initial entry is expected on July 7 or 9. Mission officials are keeping an eye on a regional dust storm that has been going on for about a week to the south of Opportunity. The storm could be a risk because dust in the atmosphere can block out sunlight, which the rover relies on to charge its batteries, or cover its solar panels. But the officials said the rover currently has very clean panels and has power to spare, and that the mission team has gained considerable experience in operating the rovers at very low power levels, such as when the sun is very low in the sky during winters. 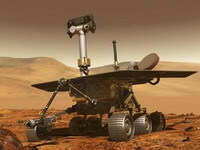 Since inception, the twin-rover mission has cost more than $900 million (668 million EUR) to date. Planned to last 90 days, the mission is in its fourth extension and another proposal would continue operations to the end of October 2008. The mission now costs $20 million (14.85 million EUR) to $24 million (17.8 million EUR) annually.